The fact that we doctors love gizmos is a big issue in same-day stem cell procedures. There are no less than 20 different machines and/or kits that will concentrate bone marrow stem cells. There’s just one problem with this concept: it’s at best a one-size-fits-all approach, and at worst it’s delivering an inferior stem cell procedure on a consistent basis. Why? The quality of a same-day stem cell procedure has three key parts: the bone marrow aspiration, the processing, and the reinjection. Bedside machines only control one part of that process, and even then, as I will show you, they do a poor job of beating our HD-BMC. What Is a Bedside Machine? Ninety-nine percent of physicians offering same-day stem cell procedures use what’s called a “bedside machine” (aka point-of-care [POC] device). This device is a centrifuge that usually has a disposable kit where the doctor inserts the bone marrow aspirate (BMA). The doctor then presses the “ON” button and comes back some time later to load whatever the machine produces into a syringe. That’s all the doctor knows about the process—where to put the BMA in the kit and how to push the “ON” button. The problem with the business model of a device manufacturer is that you want to sell as many devices as humanly possible. Hence, caring too much about what doctors do with your machine is bad for business. You also really don’t care how poorly or well trained the physician purchaser is—that’s simply not your problem. Poorly trained doctors have money that’s green, and that impacts your bottom line just as much as a well-trained physician. The problem with a device-based model of regenerative medicine is things that are outside of your control determine the quality of the process. For example, if the doctor does a poor job of drawing the bone marrow or doesn’t have a clue how to inject the stem cells accurately, then the overall quality of the procedure results suffer greatly. Like any multistep process, it’s only as good as its weakest link. To be able to press the “ON” button on the simple bedside machine the doctor bought, he or she has to know how to perform a BMA procedure. Regrettably, for almost all physicians, this isn’t something they learned in medical school or residency. Hence, doctors learn the process of drawing bone marrow in a weekend course. Also, based on our experience, almost all physicians performing this procedure today do it wrong. Or better stated, they do it in a way that maximizes their time and convenience but minimizes the number of stem cells. Hence, no matter how good the machine, if you don’t control the first part of the process, it’s “garbage in, garbage out.” The video to the right goes over some of the things that the average physician neglects to do in a BMA. At Regenexx, we know that unless we strictly control the BMA so that every patient gets a high-quality procedure designed to maximize cell yield, the rest of the treatment will be suboptimal. Hence, all Regenxx physicians are required to perform a multisite, low-volume BMA. This type of BMA has been shown by our internal data and that of others to maximize cell number. With bedside machines, this kind of control isn’t possible, and you as a patient get what you get. As discussed, all the doctor usually knows about the processing is where to place the kit and how to press the “ON” button. However, given that the goal is to concentrate the stem cells in the BMA, it’s critical that the machine can produce a high concentration of cells, also known as “bone marrow concentrate,” or BMC. Of course, this assumes that the doctor performed a high-quality BMA procedure (which is often not the case). One problem that we have seen at Regenexx is that bedside machines produce a lower-quality BMC than if we process the BMA by hand using our proprietary methods. As an example, almost all bedside device manufacturers publish their ability to concentrate total nucleated cells, or TNC. These are the important cells in BMC that contain stem cells and other cells that are likely helpful in tissue repair. Hence, the higher this number, the better. To the right is a table (click to make larger) that compares the TNC count in our HD-BMC (high-dose bone marrow concentrate) to that produced by bedside machines. Note that we can concentrate these cells to about 24 times over baseline. Bedside devices can concentrate these cells only to 1–6 times! Also, the table shows our concentration only when the doctor expects to work with a few ml of BMC. 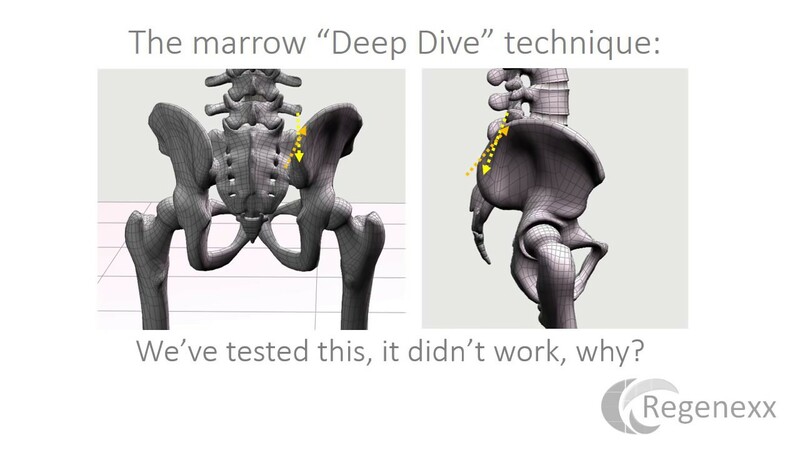 From there, we can further reduce the injection volume to allow better injections into small joints and discs, pushing that concentration up to about 75X. Also, this table doesn’t include the impact of the second stem cell fraction that we include and that all of these machines throw away. That fraction is much richer in stem cells that are even more prolific for orthopedic repair than the primary cell type the bedside devices concentrate. So let’s say that everything up to this point has been perfect. The BMA procedure was high quality and the machine is one not yet invented that can concentrate 25–75 times (or you’re at a Regenexx Network site); however, if the reinjection is poor, it’s all been for naught. How common is it that there’s a poorly accomplished reinjection? This type of thing is more common than you would think. We’ve seen patients pay for a $30,000 stem cell procedure only to have a blind injection, where the doctor couldn’t document that the cells got anywhere near the problem spot in the joint. Even if that patient had an injection under simple ultrasound guidance that was inside the joint, more often than not, those cells should be injected into the meniscus tear, a lax ligament, or a degenerated tendon as well as the joint. These last injections require advanced and specific training, which is hard to find. These problems are why at Regenexx we require all of our doctors to have these skills before they can join the network. As an example, how many orthopedic surgeons, physical-medicine specialists, or spine-injection physicians know how to inject these structures under guidance? Less than 1%. We also require them to be trained and certified by the Interventional Orthopedics Foundation, a 501c3 nonprofit dedicated to excellence in precise orthopedic injections under guidance. The doctor knows how to perform a BMA to maximize cell yield. Unless this is a Regenexx Network doctor, the likelihood of that happening is low. The process (or machine) that concentrates stem cells can achieve the highest possible number of cells. The doctor knows how to precisely place the cells using guidance, in all of the areas where they can do good things. The upshot? The good news about bedside machines is that they are great business plans, but since they can’t and don’t control for the quality of what goes in or how what comes out is used, they aren’t great medicine. To get that, you have to manage all aspects of the process, which we do at Regenexx every day. Finally, as the table above shows, our HD-BMC is dramatically more concentrated than what comes out of these bedside machines. That’s because we control what goes into the process, and we use more-advanced techniques to concentrate cells. Can this be used on a 86yr old man who is tottaly bone on bone?